Cheng tng is such a common Chinese dessert and yet most of the versions sold are quite nondescript. I was pleasantly surprised to find unusual ingredients in this little bowl. 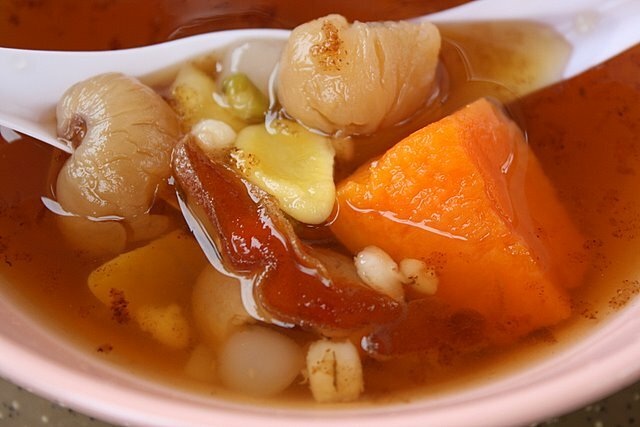 Slices of dried persimmon, candied winter melon strips, honeyed sweet potato and the bonus of ginkgo nuts. Also, oddly, green beans. Oh I also really appreciated the fact that those large tapioca pearls were still "al dente", and not overcooked, soft, mushy balls of flour. Many cheng tng these days are just flooded with barley and longans. Don't have dried persimmons and sweet potatoes. BTW been reading your blog for a while. Found the link through keropokman's site. I really enjoy reading it although it makes me dreafully homesick. I love your descriptions, the photos and the varied cuisines and meals to suit all budgets. I feel it really accurately portrays a snapshot of Singaporean culture. 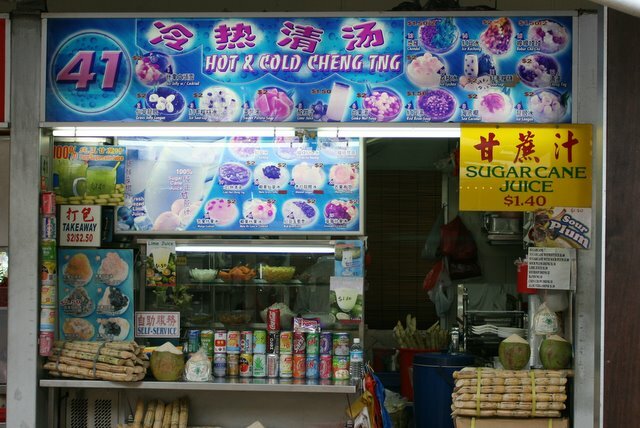 On a hot day, a bowl of cold Chng Tng cools us down. On a cold day, a bowl of warm Chng Tng warms the heart. I have seen even more unusual stuff. Like jelly! I didn't even have to scroll down to see the picture to know which stall you were describing. =] This is my favourite cheng tng stall...which says a lot since I live in the west!